What Is the Gtech Pro? Gtech is a British company that is incredibly dedicated to providing a wide range of cordless products for their consumers. Two of their most popular cleaning products are their cordless AirRam Mk2 upright, and Multi Mk2 handheld vacuums (often purchased in a package). Although it has been possible to purchase an amalgamation of the two with their Power Floor model, they’ve decided to release the newer Gtech Pro. The Gtech Pro is a cordless 2-in-1 stick vacuum that uses a bag rather than a dirt receptacle, and can easily be used both as a handheld for odd jobs or with the extension tube for floor to ceiling cleaning. Their reasoning behind introducing a bagged model when so many other cordless manufacturers are sticking with bagless is that they claim it’s more hygienic and will cut down on filter maintenance costs. Those who don’t like emptying bagless vacuum cleaners so often may also prefer it. We decided that this was an interesting release and wanted to see how well it could compare with other cordless vacuum cleaners on the market, especially 2-in-1 models. Read our Gtech Pro review to discover what we thought. Lightweight – Only weighs 2.4kg which makes it a popular option for those who are looking for a light and practical cordless vacuum. Easy to Use – The Gtech Pro has been designed to be very easy to operate, which includes changing attachments and replacing the bag. Headlights – The main floor head has LED lights to help you see dirt, as well as the main unit itself when using it as a handheld. Battery Life – Runs for up to 40 minutes on the eco setting and 20 minutes on the turbo setting. Charge Time – It takes up to 4 hours to fully charge the Gtech Pro. No Charging Dock – Some people won’t be happy with the lack of a wall dock or stand, although the battery can be removed for charging. Hygienic Bag – The Gtech Pro’s hygienic bag also acts as a filter which means you won’t ever be exposed to dirt or dust, or have to clean or replace filters. Each bag is triple-layered with a lid and has a dirt capacity of 1.5 litres which gets compressed enough to ensure you only need to replace them every 1-3 months. AirLOC Technology – The patented Gtech AirLOC system that is used with the main head helps create additional suction when you pull the vacuum backwards, making it easier to pick up both small and large particles. When you push it forward it’s designed to pick up large debris, and when pulling back the AirLOC activates to pick up the finer dirt particles. Removable Brushes – It’s easy to remove the brushes on both the main floor head and the handheld head. This is necessary as hair can tangle around the roller brushes and need to be cut away. 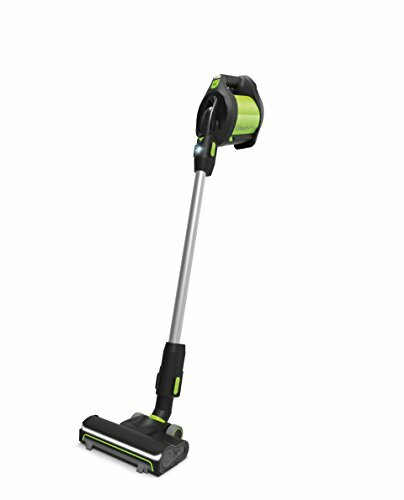 The Gtech Pro uses a 22-volt lithium-ion battery that allows it to maintain the cordless vacuum’s run time of 40 minutes on the default setting and up to 20 minutes on the turbo setting. The battery is also designed to continuously deliver power that doesn’t fade as the battery depletes. While the Gtech Pro only comes with a regular plug-in charger, you can remove the battery from the unit so it doesn’t take up too much space while charging. However, you can choose to charge the battery while it’s attached to the vacuum. Charging time takes approximately 4 hours which is indicated by 4 green LEDs on the side of the battery. As with most of Gtech’s products, the Gtech Pro is simple in design although pleasing to the eye with the company’s signature green accents. The main unit and attachments are styled in rugged black plastic rather than the typical grey, and the extension tube or wand that makes this a ‘stick’ vacuum is aluminium. The build quality is upstanding and there are no warning signs that it’s a product that will break easily. Rather than a trigger, this cordless vacuum cleaner uses a grey on/off button at the top of the handle, in addition to a green selector switch to change between the two power modes. The handle is comfortable and unobtrusive, and the attachments are easy to connect (making a firm click when they do) and disconnect. This means you won’t have to worry about attachments falling off like on some other cordless models. The unit features an LED at the front to help you see, though the main power head also has lights as well. Because the Gtech Pro uses a bag, you don’t need to worry about cleaning or replacing a filter. To remove the bag, simply lift the lid at the top of the unit which is connected to the bag. Detach the bag from the lid, close the tab to seal off the dirt and throw it away. Installing a new bag is simply a case of reversing this process. When using the Gtech Pro for the first time, it’s surprisingly well balanced as the battery is located on the front of the unit, and it’s pleasant to use both as a handheld and a stick vacuum. The main cleaning head (as with all the other attachments) can be used both with and without the extension tube and works on all flooring types. The rotating brush means that pet hair isn’t a big problem, and it picks up all types of dirt and debris – particularly on the turbo setting. The lights at the front are a nice touch as they highlight any dirt you might otherwise miss. When using the Pro as a stick vacuum you’ll find it glides along the floor and is painless to manoeuvre around and under furniture. The power brush (or mini head) is ideal for cleaning furniture as well as vehicle carpeting and is a nice addition. For tight areas, it’s nice to be able to use this with the extension tube to clean the floor where the main head won’t go. It also does a relatively good job of picking up pet hair from furniture due to the rotating brush. People who have fabric furniture that allows hair to become entangled will understand this ongoing battle. Lastly, the dusting and crevice tools make this unit complete and with the extension tube attached it’s easy to clean cobwebs off the ceiling or reach behind furniture to pick up ‘dust bunnies’ that would otherwise continue breeding. We do think that an extension hose would have been a nice addition, but for the price, this is a versatile cordless vacuum that can be used for everything from hoovering up rice on your kitchen counter to sand on your welcome mat. Compared to other 2-in-1 cordless vacuum cleaners on the market, the Gtech Pro is mid-priced, although a little on the expensive side at around £250. However, it’s very affordable when you consider the Dyson V10 is double the price. It won’t perform as well or be as versatile as the Dyson, but it’s not a bad investment for anyone looking to replace their main unit with a cordless vacuum that will hold its own. Gtech also backs all of its products with a two-year warranty for peace of mind. All in all, we were suitably impressed with the Gtech Pro as a mid-level cordless vacuum with handheld functionality. It could be more powerful, but it’s well made, has a respectable runtime and is very versatile for those who like to keep all areas of their home clean. The addition of a bag will be hit or miss with some folks, although those who find it tedious to empty their cordless vacuums or are concerned about breathing in dust will enjoy the feature. For more information visit Amazon right here. Do any bags come with the Gtech Pro? Yes, there are two bags included out of the box which can last you up to 6 months depending on how dirty your home and/or vehicle gets. How much does it cost for new hygienic bags? It’s possible to buy a pack of 10 bags for £9.99. Is it possible to buy a spare battery? Yes. Either through Amazon or Gtech’s website, you can purchase a replacement pro battery for £74.95. It’s also possible to purchase spare parts and attachments. My mum is 82 years old, would this be a good vacuum cleaner for her? The Gtech Pro is very easy to use and quite light at 2.4kg. We think that it’s a great option for most people who are elderly or who have certain limitations that prevent them using a standard corded or heavier vacuum. Can this be used on wood flooring without scratching it? Yes, the powerhead can be used on all flooring types.